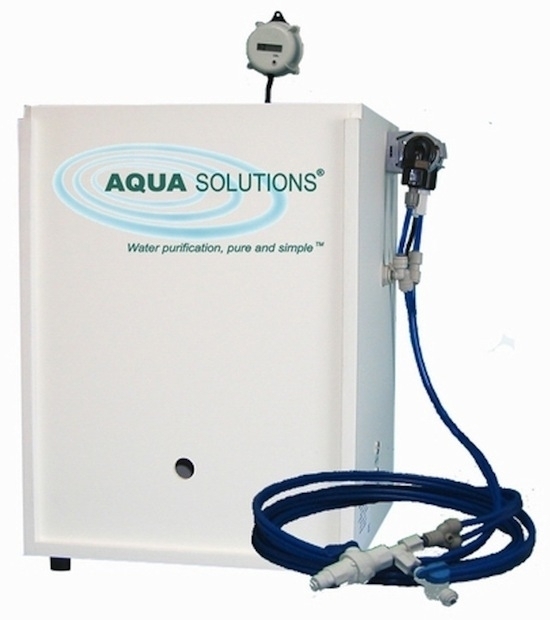 The AQUA SOLUTIONS' Model H-01-C is also available in a compact, combination Reverse Osmosis system: Model H-40-C. This model is also available for high capacity applications: Model H-40-C-H.
AQUA SOLUTIONS' Type II DI laboratory water purification systems are designed from the ground up to be user-installable and user-serviceable! This self-contained unit is specifically designed to support small analyzers and hydrogen generators. The system will process pretreated water or ordinary tap water containing up to 250 PPM of TDS (total dissolved solids), to produce up to 4 Liters of Type 2 (or better) deionized (DI) water per 24 hour day. The system includes two Purification Kits, Part Number 2212H01. The purification kit includes an activated carbon prefilter cartridge and a DI cartridge. All AQUA SOLUTIONS' Type II Systems produce purified water that exceeds ASTM, CAP and CLSI specifications for Type II reagent grade water. Continuous recirculation is utilized to ensure water quality and prevent the growth of microorganisms within the system. Includes LCD readout conductivity monitor with adjustable setpoint and flashing red LED alarm. Ion Exchange Capacity of 350 grains.